Mohammad Afzal Guru, the Kashmiri militant sentenced to death over a 2001 plot to attack India’s parliament, has been hanged after his final clemency plea was rejected. Officials said Mohammad Afzal Guru, who had been on death row since 2002, was executed at Tihar jail near Delhi. Afzal Guru had always denied plotting the attack, which left 14 dead. India has stepped up security and announced a curfew in Indian-administered Kashmir, where news of the execution was expected to spark unrest. Executions are very rare in India – Afzal Guru’s was only the second since 2004, after Mohammed Ajmal Kasab, the sole surviving attacker from the 2008 Mumbai attack was executed in November. “This is only about the law taking its course,” Home Secretary RK Singh said. Hundreds of police and paramilitary personnel have been deployed in towns and cities across Indian-administered Kashmir to try to contain any unrest sparked by the execution. Claimed in its entirety by both India and Pakistan, Kashmir has been a flashpoint for more than 60 years and two wars have been fought over it. The December 2001 attack was one of the most controversial incidents in recent Indian history, correspondents say. Five rebels stormed India’s parliament in Delhi on December 13, 2001, killing a gardener and eight policemen before they were shot dead by security forces. India blamed the attack on the Jaish-e-Mohammed militant group, which it said was backed by Pakistan. Pakistan denied involvement in the attack but relations between the two countries nosedived as their armies massed about a million troops along the border. 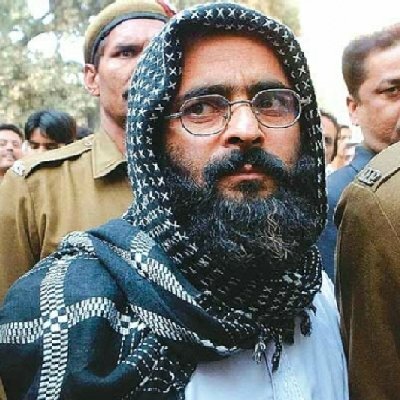 Mohammad Afzal Guru, a former fruit seller, was one of two men sentenced to death for helping to plan the attack, although the sentence of Shaukat Hussain was later reduced on appeal to 10 years in jail. He was found guilty of arranging weapons for the attackers and of membership of Jaish-e-Mohammed, both of which he denied. Two other people accused in the case, SAR Geelani and Afsan Guru, were acquitted due to a lack of evidence. Mohammad Afzal Guru’s appeal was first refused by the Supreme Court and then the president.